HIGHLIGHTS OF MARANATHA CHRISTFEST 2016 | Naija Online TV Events. The 2016 edition, of Maranatha Christ festival, was held at the Chapel of Christ Light Church, Alausa, Ikeja recently. The gospel event, which is being organized annually since the year 2009, by UK based event manager and consultant, Lola “Sophie Fey” Ajayi had in attendance this year, Mrs. Titi Aboyade Cole of Podium International, Mr. Dare Gbadebo of NaijaOnlineTV, Sophie Fey from the UK, her mother and a few members of her family, as all gathered together at the gospel praise and worship event, to give thanks to God for his ever faithfulness. Several music ministers of the gospel, took turn to impact on the lives of many at the event. Some of which were Ken Oleka, Femi Kings and Michael White, who was tremendously inspirational during his music ministration at the event. Others were comedian KC and dancers, the Cymbal too. A minister of the gospel, Evangelist. Alonge, took sometime on the stage, to inspire guests on appreciating God through Praise, worship and thanksgiving as he informed, he is aware gospel singers are less appreciated. Just after Evangelist. Alonge, popular gospel singer, Biyi Samuel of “Igi Aruwe” fame took the stage and ministered with his hit song, “Igi Aruwe” amongst other beautiful songs he rendered, while the congregation gave him a standing ovation. After Biyi Samuel was done ministering, top Nigerian comedian, Okundalaye Ayodele popularly known as “Saco”, took the stage to entertain the guests, dropping rib cracking jokes to the delight of all present. Other music ministers that ministered during the course of the event are Hosannah voices, The Ordained, MCM Choir, Debo Shodeinde and Nike Voices, who were all outstanding during their ministration. Another highpoint recalled during the event, was the word of exhortation from a man of God, simply known as Pastor. Daniel, who took time to analyse the 3 different things that matter before God, which he says are praise, thanks and worship. The report however, will not be complete without making mention of the ministration of ” Midnight Crew ” gospel group member, Mike Abdul, who came in attendance with one of the presently most inspirational female gospel singer in Nigeria, Monique, as they both climbed the stage using a same band. While Mike Abdul, initially led the band, ministering in some of his hit songs, Monique acted as a back up singer lending some support, however she later took the centre stage, while Mike Abdul, acted as a back up singer for her. As if his earlier music ministration was just a rehearsal, after a very powerful moment of releasing soul lifting songs. Mike Abdul, took the microphone from Monique later on and gave a very superlative music ministration session, singing some of his earlier released songs and new ones as well, as the event eventually ended. One of the expected gospel music minister, who could not attend the event due to an engagement in London, United Kingdom, is Ayaba Esther George. A top renowned and well celebrated Nigerian gospel music minister, who is also an ambassador of Maranatha Christfest. 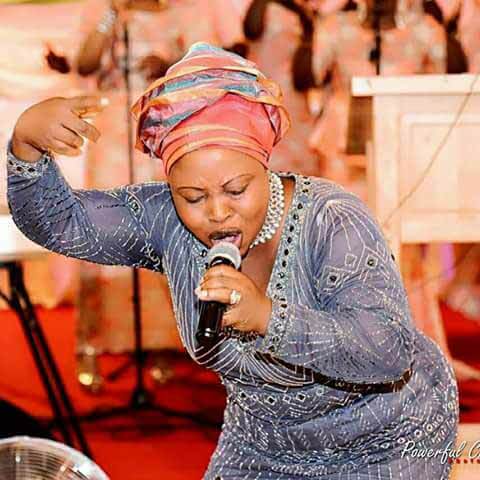 Lady Evangelist Ayaba Esther George, left many of her fans and followers in Nigeria disappointed as she is presently based in London, United Kingdom and due to her very busy schedule and engagements could not attend the 2016 edition of Maranatha Christfest gospel event, held in Lagos, Nigeria.